Madelinetosh Vintage is well stocked and on sale in the shop right now, so we thought it was time for a post highlighting this beautiful yarn. Vintage is 100% superwash wool, on the heavy end of worsted weight. It’s meant to be a high quality workhorse yarn, versatile enough for small accessories and outerwear alike, but still bouncy and soft to the touch. I’ve personally used Vintage in a number of projects. I originally bought a large number of skeins, thinking I would make the Kerrera Hoodie. This pattern is beautiful, and has been knit in vintage by a number of Ravelers with beautiful results. 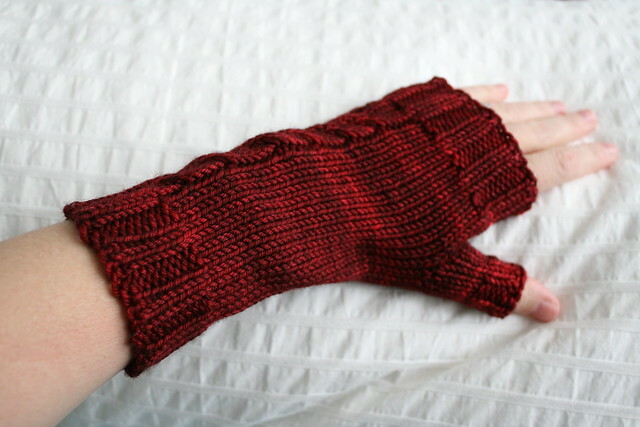 The Commuter Fingerless Mittens were a perfect use for my Vintage in Tart. The simple stockinette and cable really allow the yarn to shine, and the pattern is free! 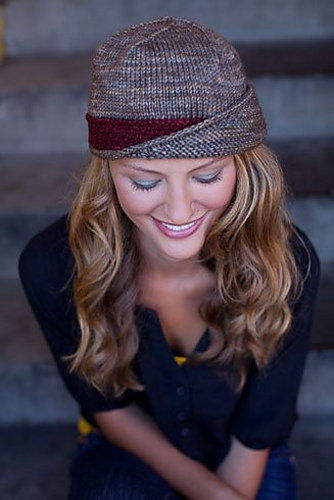 The Lucy Hat featured in the new Knitscene magazine is another great project for Vintage. Whatever patterns you decide on, Vintage is a great choice for projects that call for beautiful, saturated colors, and hard wear! Newly posted in the online shop from Madelinetosh is Tosh Chunky Limited Edition. This hand dyed yarn has the same lustre as the Tosh Chunky currently in production, but with a slightly thicker gauge, and a tighter and bouncier twist (14-16 st per 4 inches/10 cm). are calling my name, though I did see a listing for the ever popular Tart! I’ve been on a hat kick lately, knitting mini Thorpe hats for my toddler and all his little friends, but with the gauge given, this yarn would be perfect for an adult sized Thorpe. What a lovely holiday gift that would make! If you’re not in hat knitting mode, the Confection Baby Shrug is also in my queue, and matches the gauge! . For the crocheters, it would make super squishy and warm Lizzie slippers! There’s also the ever popular Cherry Garcia Cowl, which would look beautiful in one of the solid colorways. Whatever pattern you chose, I don’t think it’s possible to go wrong with this yarn. Anything that has this much squish and bounce is super enjoyable to knit with.